AN AWESOME RARE FIRST EDITION AUTOBIOGRAPHY SIGNED IN BLACK. 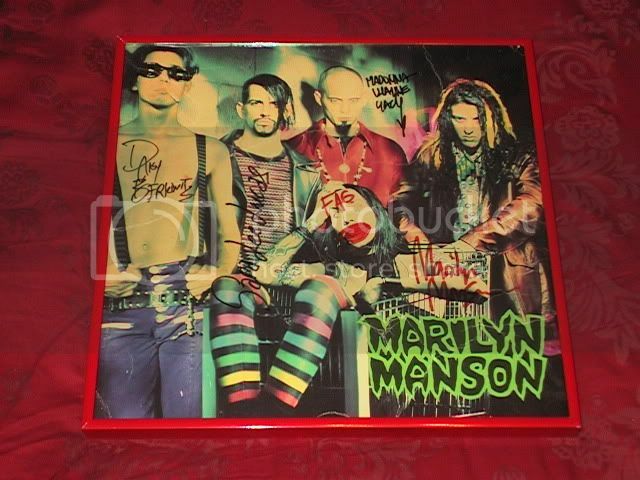 AWESOME ULTRA RARE CONCERT USED 18 INCH DRUM SKIN SIGNED BY TIM SKOLD~MANSON~GINGER~JOHN 5~GACY!!! WITH FULL CERTIFICATE OF AUTHENTICITY BY THE SECURITY CREW. There is a bunch of other stuff in this auction too. I WISH so much I could get it. Last edited by Emma; 04-08-2010 at 05:03 AM. Last edited by vilebody; 12-26-2012 at 05:24 AM. Last edited by vilebody; 12-26-2012 at 05:23 AM. but I was wondering if any collector hangs around here will do (Frau Dietrich, BlackEden, Litso etc...). I am probably a bit crazy and when it comes to the music of Mr Manson. Some (most of them are relatives, what a wonder) even say that I am willing to pay insane prices for some items and I honestly can't deny it. But although this promo is without question one of the rarest and greatest items to have (at least in my opinion), I neither don't have the money nor am I stupid. Collectiing always goes along with waiting. Watching the market, waiting and hoping for bargains or at least acceptable/normal prices. Last edited by vilebody; 12-26-2012 at 05:20 AM. .. but I was wondering if any collector hangs around here will do (Frau Dietrich, BlackEden, Litso etc...). No, I wouldn't bid on it either - not for a starting price of almost 500$. I would place a bid if the starting price would be 50$ and then watch how high it will go. I agree, the starting price is way to high. Last edited by vilebody; 12-26-2012 at 05:19 AM. Some of you guys get in many items every week, I guess would the same thing to try to catch this one and then don't buy any other thing for about a month or two. Of course, that's what I did with my Lunchbox demo-tape because it was worth it in my opinion. But in this case I'd prefer buying 50 other items instead of this one. At least at the moment, maybe I am of another opinion in one or two years when I still didn't get it for a better price, who knows how the prices will develop.